In this post, I have written about two simple but very strong Vashikaran Experiments using the same Maha Kali Vashikaran Mantra to put a Vashikaran Spell on any desired man or woman for any motive or to bind your Saas or Mother-in-Law under a Vashikaran Spell and control her for any purpose. The procedure of practicing both these Vashikaran Experiments is almost the same with only slight variations and the Vidhi is very simple and takes hardly 2 minutes to practice. To put a Vashikaran Spell on any man or woman for any motive, including love, marriage, business, friendship and money. 1] In the morning, after washing your mouth, take drinking water in the palm of your right hand. 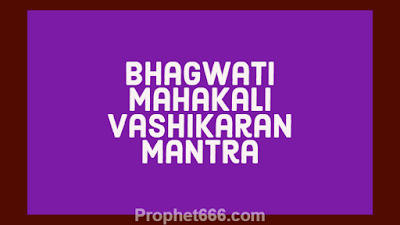 2] Then, chant the Vashikaran Mantra given below 7 times and drink that water. 3] This same procedure has to be repeated for 7 days continuously in order to put a Vashikaran Spell on the targeted person. To put a Vashikaran Spell on you Mother-in-Law- Saas and control her for any motive. 1] In the morning, after washing you mouth take drinking water in your palms, this has to be done by joining the palms and filling water in the hollow that is created by joining both the palms. If unable to do this yourself, then you have to ask someone to fill the water in your palms. The water can also be filled by holding the palms under a tap or dipping them into a utensil and taking out the water in your palms. 2] Then, chant the same Vashikaran Mantra 7 times and drink that Vashikaran Mantra infused water. 3] This Vashikaran Mantra for binding your Mother-in-Law has to be practiced for only 1 day. This will make your Mother-in-Law amicable, co-operative and helpful and not create problems for you or fight, argue or quarrel with you. Notes- Both these Vashikaran Mantra Experiments can be practiced by any man or woman on any day in the morning after washing your mouth. Even though, the Vashikaran Mantra contains the name of Maa Bhagavati Kali, the Divine Mother, there is no Puja-Vidhi prescribed for the practice of these Vashikaran Mantra Experiments, However, you can always worship the Divine Mother is you wish. 1) While doing first mantra, we only need to have mental image of person for whom we need to perform. right? 2) Can one do 2nd mantra to make love marriage decision on our side if problem of opposition is from girls mother i.e mother-in-law. Or. Compulsory couples shuld be married to count girls mother as mother-in-law? Hope u understand the 2nd point question. You have to take the name of the desired prson and drink the water. Mother in Law mean the mother of the girl or boy you are married to and not a future Mother in Law. Comiting sucide is the inability to face the truth and as per some texts the person who comitts sucide will have to take birth again and face the same situation. However, no one is in a position to correctly advise on this matter and you will have to seek the answer yourself. Are we supposed to chant the mantra 7 times by taking water only once in the hand or are we supposed to drink water after chanting every single time. Aur dusri baar jaap kiya tho phir se haath me liya hua paani pee liya. The water has to be consumed only once after chanting the mantra seven times.